Two Hialeah (Fla.) police dogs — a seven-year-old bloodhound named Jimmy and a four-year-old Belgian Malinois named Hector — recently died when their handler left them in his vehicle after returning home from his midnight shift. The officer — who has been relieved of duty pending an investigation — seemingly forgot his two partners in the back seat in the morning, and discovered them dead in the early evening. Temperatures had reportedly reached 86 degrees that day. Understandably, the reaction among PoliceOne members — many of whom are also K-9 handlers — has been a mixture of grief and outrage. “So, so sad. RIP Jimmy and Hector. I am sorry your human failed you so completely,” said one member. Many people have wondered whether or not the car was equipped with a heat alarm system. We would hope that any K-9 unit would be thusly equipped — particularly in a hot state like Florida — but the reality is that some agencies don’t have this essential officer safety equipment. 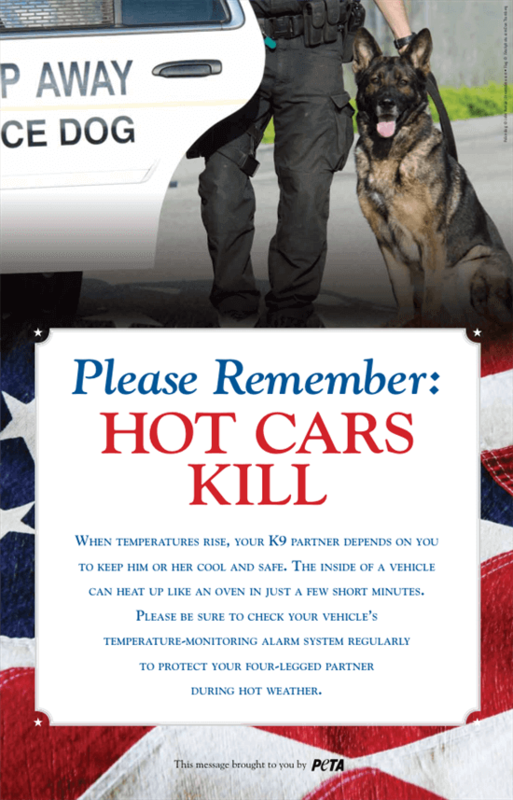 While these systems should be mandatory, training and tactics are equally important in stopping K-9 deaths in hot cars. Just as we lose too many officers to trees and phone poles in completely avoidable single-vehicle crashes, the sad truth is that deaths of police dogs in hot cars happen all too frequently. In fact, according to PETA, at least 20 K-9s “experienced terrifying — and entirely preventable — deaths after being left in patrol cars on hot days” from 2012 to 2014. For example, K-9 Sasha died after her handler left her in his SUV over the Labor Day weekend in 2012. Sasha clawed through parts of the seats, bit through seatbelts, and tore off the rear-view mirror in her frantic attempt to escape the vehicle. But such fatalities don’t require that the dog be left for a weekend or a whole day. In Delaware last year, K-9 Caro died after he was left inside his handler’s vehicle for two hours on a 95-degree day. In South Carolina, K-9 Emma died from heat exhaustion after she was left inside her handler’s vehicle for about 90 minutes — although the car was running and the air conditioning was turned on, the air conditioning had malfunctioned. On a 78-degree day, the temperature inside a parked car can soar to between 100 and 120 degrees in just minutes, and on a 90-degree day, the interior temperature can reach as high as 160 degrees in less than 10 minutes. Dogs whose body temperatures exceed 106 degrees or higher (not fever-related) can quickly suffer a heat stroke and multiple-organ dysfunction, according to petMD. This week, PETA contacted the National Association of Police Organizations, the National Police Canine Association, the American Police Canine Association, and other K-9 organizations urging the installation of heat-alert systems in patrol cars. Such systems have been available for years from companies like Radiotronics, Criminalistics, and Ray Allen. The recommendation that this equipment should be standard is a good one, but we also must remember that stuff breaks — sometimes with tragic consequences. In 2012, this happened twice within the same month. An officer in New Jersey left K-9 Serge in a patrol car for two hours with the engine running and the air conditioning on. Serge died when both the air conditioning and heat alarm systems simultaneously failed. Two weeks later, a deputy in Mississippi left K-9 Chuck with the vehicle running and the air conditioning unit on, only to return a little more than an hour later and discover that the engine had failed. An investigation later revealed that the power to the temperature-monitoring heat-alert system had been interrupted and the system was rendered inoperable. Mechanical failure is why another element to PETA’s current effort is an equally important point for discussion. They distributed this poster, which reminds officers to regularly check on the functionality of the heat monitoring system. Perhaps agencies with K-9 units should require that their handlers be trained by the motor pool personnel so they can do daily maintenance checks on this equipment. Perhaps the mechanics should insist on doing the inspections themselves, but still train handlers on the basics. Regardless, I’d go further and require that all K-9 handlers always check the back seat when turning off the vehicle at the end of the day. At the end of every shift, every officer should inspect the back seat of the squad, looking for contraband like baggies of dope, handcuff keys, weapons, and other items subjects tend to leave behind. A K-9 handler should be subjected to the same required end-of-shift standard-operating-procedure. The back seat of a K-9 unit doesn’t carry customers. It carries something far more vital — your partner! — so that area should be treated with the highest care possible. Whether it is a take-home unit or a pool car, a visual inspection (with the door open) of your back seat area should be SOP. Forgetting and leaving your partner there to die in horrible suffering is absolutely unacceptable.